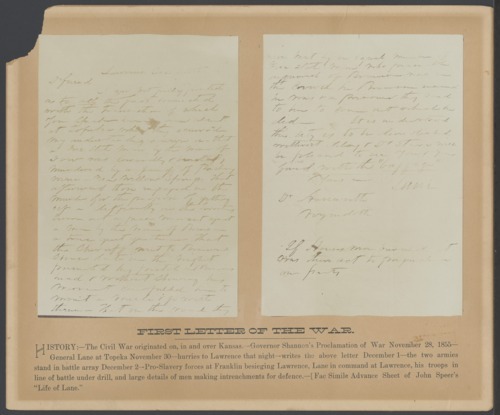 A facsimile of a letter written by General James H. Lane, labeled as the first letter of the "Wakarusa War." This skirmish was between pro-slavery and anti-slavery forces near and at Lawrence, Kansas. There was only one casualty before a treaty was signed to end the war. Collections - Manuscript - Miscellaneous - Misc. : A-Al - Ainsworth, R.M.